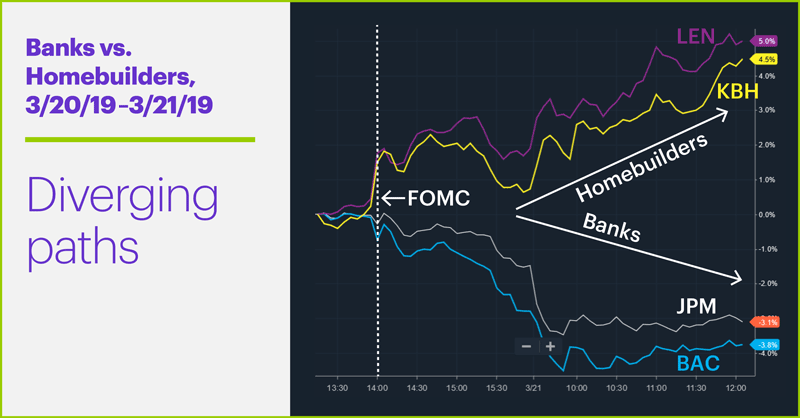 Considering the Fed basically did what everyone expected it would do on Wednesday—pledged to stay patient on interest rates—the reactions in some areas of the market were pretty remarkable. The immediate big-picture reaction was anything but, though. The S&P 500 (SPX), which had traded in negative territory for much of the day, closed down modestly after an initial post-announcement pop. But two areas of the market exhibited very different—and larger—reactions as traders further digested the “news” yesterday. As the SPX put together a solid rally, bank stocks took a powder and housing stocks took flight: Around noon ET, the S&P banking index was down around 1% while the S&P homebuilders index was up 2.3%. 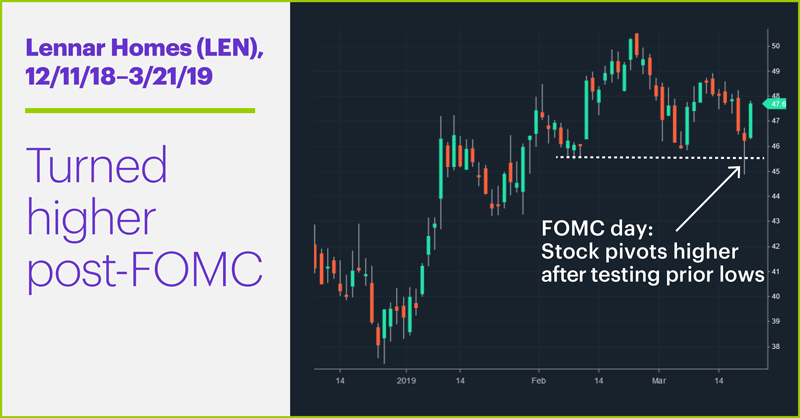 The five-minute chart above shows the paths of two bank stocks, JPMorgan Chase (JPM) and Bank of America (BAC), and two homebuilders, Lennar Homes (LEN) and KB Homes (KBH), after the FOMC announcement. Roughly halfway through yesterday’s trading session, both homebuilders were up at least 4.5% from where they were before the announcement, while both banks were down more than 3%. To boil down these divergent reactions to their essence, the low interest rate environment portended by the Fed announcement implies smaller profits for businesses that lend money (banks), while it also presumably bodes well for homebuilders, which could see a bump in their business because of lower mortgage rates. And in the wake of the Fed announcement, mortgage rates did indeed drop to a 52-week low1—just in time for the traditional spring-summer home-buying season. And don’t look now, but after a dismal 2018, the housing sector is doing something it hasn’t done in quite a while—leading the broad market. As of yesterday, the S&P homebuilder index was up around 18% year-to-date vs. a roughly 13% gain for the SPX. A continued housing rally isn’t a lock any more than a prolonged bear market is a done deal for banking stocks. The Fed always retains the prerogative to change its stance, after all, and a less-discussed aspect of Wednesday’s announcement was the Fed’s lowered (but still positive) economic expectations.2 Nonetheless, some traders may be thinking about the potential for certain housing stocks to renew their ascent while they have a favorable tailwind. Keep an eye on next week’s rush of housing data, and today’s existing home sales number. Things could get interesting. Today’s numbers (all times ET): Existing Home Sales (10 a.m.), Wholesale Trade (10 a.m.), Baker-Hughes Rig Count (1 p.m.). Today’s earnings include: Tiffany (TIF). 1 Fortune. Mortgage Rates Hit 52-Week Low After Fed Meeting. 3/21/19. 2 New York Times. Fed, Dimming Its Economic Outlook, Predicts No Rate Increases This Year. 3/20/19. Trading when vs. trading why Timing isn’t everything—unless you’re a short-term trader.